By buying Chapter Packs, fixed 40 card supplements that feature 20 distinct cards, players will be able to customize their core decks, or create strategies and decks of their own. In this strategic card game players take on the roll of one of the ‘Houses’ from the Game of Thrones series, the base game features the Starks, Lannisters, Targaryens and the Baratheons. The game is a race to collect 15 power tokens by winning challenges and meeting the conditions on certain cards. There are multiple types of cards involved in the game so I will quickly explain each of them and then get into the game play. Characters: Characters are used to win challenges, there are ways that characters can gain their own ‘power tokens’, these count towards your 15 needed to win, however they are discarded if the character is destroyed. Character cards are the easiest to tell apart because they are the only cards with a strength value, this is located on the bottom left of the cards artwork. Attachments: These cards are used to enhance cards you already have in play, the majority of attachment cards go on characters however some can be placed on locations. You can tell an attachment card apart because they have a ‘chainmail’ border around their cost and card name. Locations: Locations are used to provide you with additional abilities, gold income and some lower the cost of playing other cards, basically they are used to make your ‘house’ more powerful. Locations are played in your area and are semi permanent, (they do not get removed unless another card says so) they are easy to tell apart from other cards because of the map border surrounding the cards name and cost. Events: Event cards are played from your hand to alter or change a situation. After the ‘text’ on the card is resolved it is immediately discarded. You can easily tell them apart by the bird border that runs up the left hand side of the card. House Card: These simply act as a representation of what house you are playing, you will place power tokens on your house card throughout the game. In addition to these functions your house card will also tell you the turn order. Plot Card: Plot cards are kept in a separate deck from the rest of your cards. At the start of each round both players will select one of these from the deck and play one simultaneously. You can only have 1 revealed plot card at a time, they provide you with income, initiative and a “claim” value that determines the effects when you win a challenge. Agendas: These are a modifier to your House Card, you can only have 1 and you must select it before the game starts, once selected it may never be removed during the game. Agendas provide both a benefit and a drawback for the entire game. Plot: Both players select and reveal a plot card from their plot deck, this is placed over top of their previous plot card and if you reveal the last card from your deck all plot cards except the revealed one can be reshuffled. Draw: during the draw step players draw 2 cards, if their deck is empty you cannot draw cards but nothing else happens. Marshalling: The marshalling step is completed by one player and then the next until all players have completed the marshalling phase. During this step players determine their gold income by adding their ‘plot card’ to other bonus incomes. Then they place ‘character and support’ cards from their hand by paying the gold cost. Note: If you play a card from a house that is not your own you must pay 2 additional gold. Challenges: There are three different types of challenges and they each provide the winners with different benefits. Note that if the ‘defender’ wins a challenge no action is taken. > Military Challenge: The loser must choose and kill the number of characters equal to the attacker’s ‘claim value’. Note: These characters do not have to be characters that were in the challenge. > Intrigue Challenge: The loser of this challenge must discard at random cards equal to the attacker’s ‘claim value’. > Power Challenge: The ‘attacker’ takes power tokens equal to his/her claim value from their opponent’s house card. If a player wins a challenge and the defender’s strength totals 0 then claim an additional power token. Once the first player has had a chance to initiate challenges it becomes the other player’s turn to do so. Note that once you have ‘attacked’ a challenge your character is considered to be ‘kneeling’ and is spent until your next marshalling phase. To signify this, turn the character sideways, Note: A character that is not ‘kneeling’ is considered to be ‘standing’. Dominance: During this phase players count the total of all their ‘standing’ characters and add 1 for each gold coin leftover from your marshalling phase. The player with the highest total is awarded 1 additional power token. If there is a tie no power is awarded. Standing: During this step both players ‘stand’ all their characters, locations and attachments. Taxation: All players must return any unspent gold to the treasury to stop you from stockpiling. Once you have gone through these steps, you repeat them and the player who was the ‘active’ or first player last turn now goes last and the player who went last goes first. Multiplayer Games: In a game with 3 or 4 players there is an additional rule of ‘titles’, players take turns selecting them during the ‘plot’ phase. These titles provide you with a benefit, and force you to support or oppose another title. You cannot start challenges with a title that you support; also you may block or ‘defend’ for the player whose title you support. If you win a challenge against a title that you oppose you gain 1 additional power counter. Titles are returned during the ‘taxation’ step and are chosen again during the plot phase. In a 3 player game the titles are not returned until they have all been chosen, in a 4 player game they are returned right away at the end of the taxation phase. Components: How great can the components to a card game be? Well when it includes 3d markers to signify your title and the titles are directly related to the games lore or theme the answer is pretty awesome. The artwork on the cards is great, the gold and power tokens are nice and the title markers are awesome. Who will enjoy a Game of Thrones the card game? Family Gamers: Unless your kids are older or you’re already experienced with board games and like fantasy themes I would stay away from this one. Violence, double crossing and conquest for power are not traditional family game qualities, there is also a lot of text and rules. Casual Gamers: A Game of Thrones the card game is set in a universe widely enjoyed by so many people, from books to games and a HBO TV series there are lots of people who at least know what it is. A good theme can make or break a game for casual players even if the game itself is awesome. If you are a casual card gamer, or are in love with the theme then this game is for you. Gamer Gamers: Especially once you add in the multiplayer components A Game of Thrones becomes a deep strategic card game of treachery, deceit and short term alliances formed for personal gain. Even if you don’t count deck building as part of the strategy this is still a very deep game which is good for gamers who are not ‘card gamers’ and just want to play right out of the box. This game will appeal to ‘serious’ strategy gamers, card gamers and anyone who is familiar with A Game of Thrones setting. Fans of the books might find A Game of Thrones: The Board Game to be a bit more filling, as it really captures the epic feel of the world and the ebb and flow of each House’s fortune and is designed to create the sort of backstabbing and intrigue that is the hallmark of Martin’s universe. But the living card game is a languid swim in the mythos, steeping you in the characters and events of the universe. It took a bit for me to get used to the rules, but the similarities with The Lord of the Rings: The Card Game (the phases, token use, etc) helped. I enjoyed playing with the core set, and didn’t feel obligated to expand the game with chapter packs (though I did.) I’m not a fan of CCGs, so I never tried this in it’s CCG days. I am delighted that I can go get a couple chapter packs and know what I am getting and adding to my collection. I’m not sure I would play it if I weren’t a fan of the books… I’m a big coop fan and find LotR:TCG to be a better experience. But when I want a conflict heavy LCG experience, this will be my go-to game. I’m rating it really high on replay value. The nature of these games, even in the limited scope of the core set (or multiple copies of the core) allow you to try lots of different combinations of cards and strategies. As far as components, it’s a card game with a small board and some lovely little figurines and tokens… the components are certainly doing their job. I might’ve preferred more iconic wood pieces, but that’s a personal preference. Ease to Learn – that’s the sticker. It took a while for me to puzzle through the manual and ultimately saought third party examples. But with a game with this many inter-card interactions, it’s bound to be difficult to get into for some folk. But it’s worth it! I played some LCG from Fantasy Flight now (Warhammer Invasion, Lord of The Rings, Game of Thrones) and I must say Game of Thrones is by far the best. Yes, it is not easy to learn, but if you like player interaction this game is the right thing for you. Do you kill some of the opponent’s character? Or do you try to steal some power from opponents? While doing that you still have to take care of yourself. 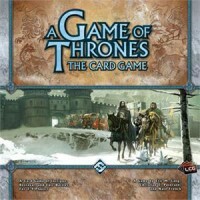 I don’t know Game of Thrones – The Board Game, but the card game is challenging and is a lot of fun. Fantasy Flight has taken this model and done extremely well with it in regards to the Call of Cthulhu LCG, and the Game of Thrones LCG. What they are doing is lowering the cost to themselves and to their players. By releasing a base set with small supplemental sets in a non-collectible environment, both the publisher and the players are aware of their long term costs. This allows Fantasy Flight to reliably predict sales, as the base number of players remains relatively stable, and the sales numbers are largely unaffected by a “bad” set, as players are only out $20-60 every 1-2 months as opposed to collecting rares and driving the cost well beyond that in the CCG model. I love the Game of Thrones universe, and for the most part I like this game, but it has one major drawback. It just takes way too long to play. Production values are top notch. Deck building is fun. The mechanics reflect the theme well. The game tends to run long, especially with more than 2 players. Perhaps house ruling victory conditions would help. Another complaint is that there are a lot of text on the cards, so if you haven’t memorized all the cards, it’s hard to tell everything your opponent is capable of. Bottom line: I won’t suggest playing this game, but would play if someone else really wanted to. I would play 2 player on occaison, but rarely with more. If I wanted a GoT experience with more players, I would recommend the GoT boardgame. Sadly the wording on the cards and the rules leaves a lot to be desired, and you really can’t play this game without having the rather large FAQ at hand. I am used to dealing with complex rule sets, but the tedium of constantly looking things up and dealing with corner cases took away my initial enthusiasm for this game. GoT has a ton of rules and quirks that make it more than just another Magic clone. You have three different types of attacks per turn, and with some cards you’ll be hard pressed to choose which style will work best for any given situation, but it makes for a lot of strategizing. With several ways to win, different decks can have radically different tactics against each other. I am huge fan of the Game of Thrones book series. I love this card game because I think it did a great job incorporating awesome characters and memorable events/places into the game. I’m an avid game player and caught on to this game quickly. My fiance and I also have all of the chapter packs, so we have gotten into custom deck building with our favorite houses. This is one of my favorite card games to play. My favourite game/card game of all time! You can play 2 players mode or multiplayer, but the game really shines when playing with 3 or 4 players. I’ve tried lots of different CCG’s and LCG’s and this his hands down the best! Going to purchase the second edition soon. Btw can boardgamers update so we can also have the second edition here in the database? 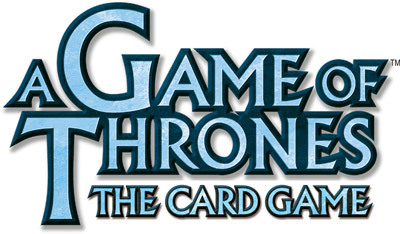 Add a Review for "A Game of Thrones: The Card Game – Core Set"